Will political parties strengthen transparency and anti-corruption? Subject: Will political parties strengthen transparency and anti-corruption? 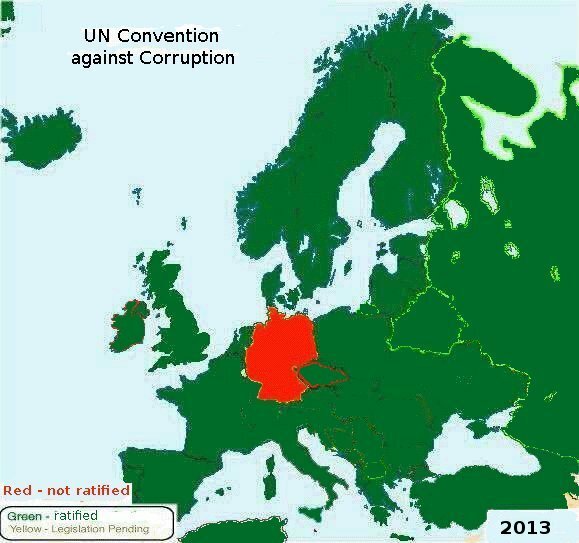 Germany has to improve the federal FOI law, adopt FOI laws in 5 local states (Bundesländer), ratify CoE and UN conventions against corruption and improve transparency of funding of political parties to catch up with Europe, America, OSCE, OECD, G20 and BRIC states (see weakness no. 2, 3, 4, 8, 34, 35 and 52 of National Integrity Report Transparency Germany. : http://home.broadpark.no/~wkeim/foi-ngo.htm). Federation: CDU/CSU, FDP, (Dr. Max Stadler), SPD, GRÜNE, Linke und chancellor. Local states: Hessen (FDP), Bayern (FDP), Niedersachsen (FDP), Baden-Württemberg (Innenminister) and Sachsen. Direct to chancellor gives an opportunity to vote. Parliamentwatch (abgeordnetenwatch) offers an opportunity to be informed about the answer. Result: The majority parties objects a general access to information law. Only the opposition is positive. Dark green: Access to Information Law. Light green: Access to Information in constitution only. Yellow: Access to Information Law pending.